Trinity Episcopal Church of Roslyn has recently completed its fundraising campaign for its Foundation Stabilization project. Thanks to the enormous financial support of three foundations, one trust and several generous parishioners, the historic church is hoping to begin and complete construction over the summer to stabilize the foundation in the nave of the church. The first major grant was provided by the Barker Welfare Trust for capital needs of Trinity Roslyn. The Vestry determined this was the best use of these funds. Then, in October, $25,000 was provided by the New York Landmarks Conservancy. It has a Sacred Sites program to assist religious properties on the National Register of Historic Places. The Landmarks Conservancy has made hundreds of grants to religious organizations to help save the many historic jewels in New York City and beyond. The third major grant of $25,000 was given by the Gerry Trust. Roslyn residents are familiar with the many historic homes and buildings that have benefited from the Trust, established by Roger and Peggy Gerry, longtime Roslyn Village residents. Lastly, the Trustees for the Estate Belonging to the Diocese of Long Island furnished a $75,000 Capital Works and Maintenance grant for this urgently-needed structural repair. The Church is very grateful to all of these interested organizations so that this magnificent historic structure will grace Roslyn Village for the next 100 years. Trinity Episcopal Church was built in 1906 by famed architect Stanford White of McKim, Mead & White. The Church contains several windows attributed to Tiffany. The Very Rev. Margaret Peckham Clark has been the Rector for the past 15 years. 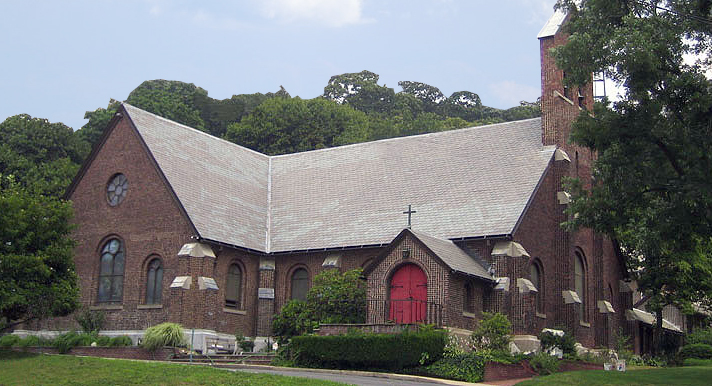 The Trinity Church complex houses several organizations such as Child Abuse Prevention Services , the Roslyn Trinity Cooperative Day School and most recently, the Trinity Episcopal Church Roslyn Childcare Center. In addition to several self-help groups meeting at the Church, including Alcoholics Anonymous and Narcotics Anonymous, the Outreach Committee at Trinity serves approximately 2600 individuals or families in need in the greater Roslyn area. For more information, please call the church office at (516) 621-7925.